One Mobile Home Dealer is not the same as the next. In general, most are out to make a dollar and are not really interested in your satisfaction. And most will sell you a home that may not be the best one for you. You must be on your guard when choosing a dealer and you must shop around. However, we have consistantly seen that West View Manufactured Homes delivers the best home for the money. They also put the customer's wants ahead of what makes them the most money. "We have had nothing but the GREATEST experience with Tom Minkel & West View Homes! This was all new to us and Tom was there to help through every single step of the way. He treated us like family and was patient and knowledgeable. Tom made it convenient for us while designing our new home and would drive to us numerous times to show us design options & meet us at numerous locations to walk through homes and give us ideas. We would HIGHLY recommend working with Tom Minkel. 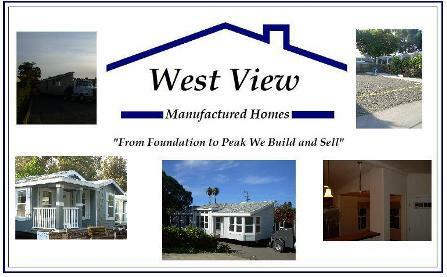 West View Manufactured Homes is a great Mobile Home Dealer and they won't rip you off. This is a great head start in having the best experience possible when installing or buying a new Mobile Home. Tom will take care of all the details that you may not know to ask for (unless you read the other pages on this site!). Make sure to ask about the vapor barrier he installs, the fact that moving the utilities, if needed, is included, and all the details that go into his homes - details that most other dealers will not tell you about and will not spend the extra money from their profit to do for you. By Will Cunningham. Your satisfaction during and after you move in is his top priority. Click here to go to their site. When choosing a Mobile Home Dealer, choose wisely!